The Kensington Walnut Side Table is 100% British made. Manufactured here in the heart of England using high quality materials such as compressed MDF Veneer, natural solid walnut wood and high quality AC paint designed to stand the test of time. It is one of the most beautiful cabinets in our Kensington range. Carefully created by skilful craftsmen, this contemporary side table would look great in any home space. When selecting something from part of our Kensington Range you are inviting even more vibrance and sophistication to your way of living. The Kensington Side Table holds a strong, modern retro look for any setting to suit your lifestyle. 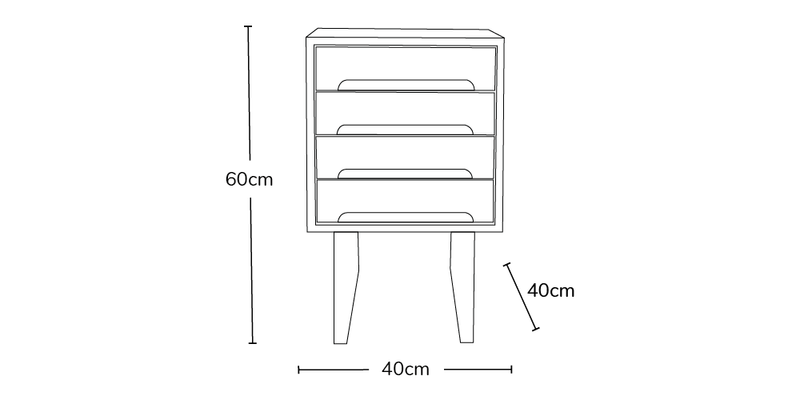 This unit includes: 4 draws and 4 solid walnut legs. Whether used for a bedside cabinet or as an everyday living table, this beautiful edition is definitely an eye catcher. Whether you choose oak or Walnut this modernistic unit will prove to be the talking point in any home.